When I get an out-of-town visitor that also doesn't have a car, the logistics of arrivals and departures is a bit of a challenge. 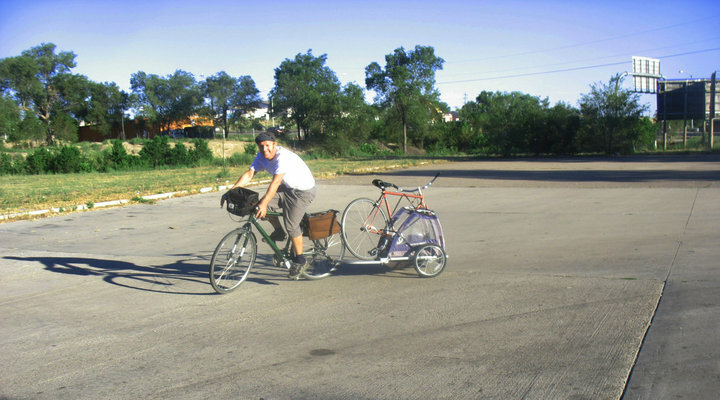 Rita arrived in Pueblo via Greyhound bus after completing her cross-country bicycle trip from Virginia to the Oregon Coast and wanted to see Pueblo one last time on her way back to Rhode Island. Unfortunately her bicycle was on another bus being shipped back to Rhode Island. 1. Ride one bicycle, with the other bicycle on a trailer, so that my guest has a bicycle to ride home and any luggage can be carried home in the trailer. 2. Ride one bicycle one handed towing empty trailer, and guide the other bicycle with the other hand along side. I actually did both, using one method to pick Rita up, and the other method once she left the bus station to return home. Choice #1 is much easier once you get the spare bicycle strapped to the trailer.